“It’s not what you know, it’s who you know.” That timeless little gem is just one of the seemingly never-ending chunks of sage advice that my father has imparted to me over the years. I happen to know a guy named Tom Kloster. I met Tom through Portlandhikers.org; a site that I now help moderate, and a big reason for my Northwest outward bound tendencies. Tom is one of the sweetest guys you’ll ever meet. He also happens to have been born and raised here in Portland. And perhaps even more important with regards to this topic, raised on the trails and in the woods of Oregon. 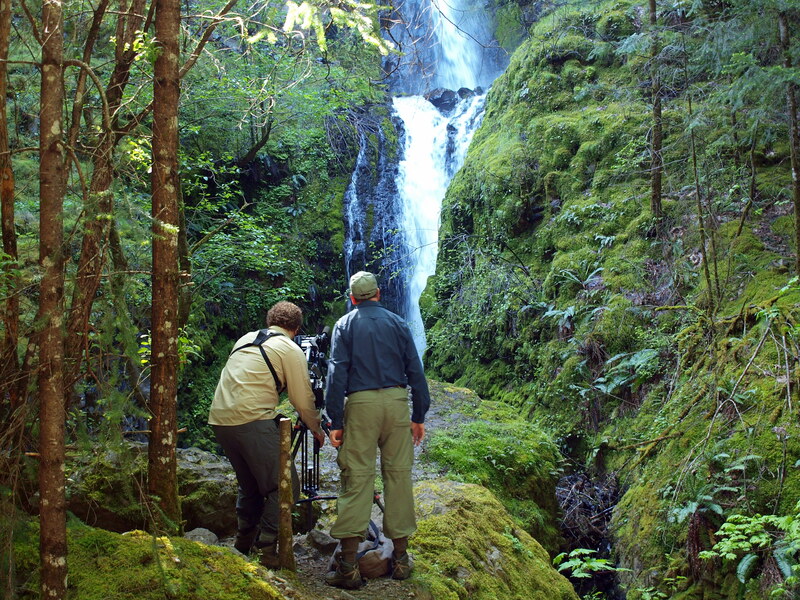 Tom has recently become the torch bearer for what I consider to be a very worthy cause; the restoration of Warren Falls in the Columbia River Gorge. The idea apparently piqued the interest of the folks over at Oregon Public Broadcasting, because they decided to do an Oregon Field Guide piece about it to air later this fall. This is where the whole “It’s not what you know, it’s who you know” thing comes into play. Tom invited me and another hiking friend of his, Jamie, to come out and be a part of the shoot. For me, this was a big deal. Oregon Field Guide is to outdoor loving Northwest folk what “Twilight” is to 13 year old girls. I was very happy to be invited. The back-story is this. 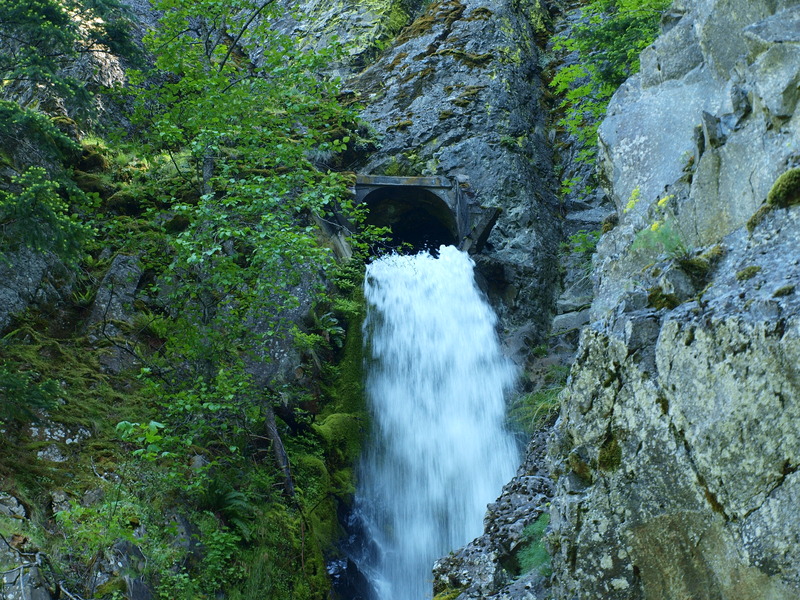 In 1939 the highway department constructed a massive metal weir and tunnel system to divert water from the top of what was once Warren Falls, through a massive basalt cliff to where it now spits out as Hole-in-the-Wall Falls. The reason for all of this rather impressive engineering was that Warren Falls was somehow interfering with the newly constructed Historic Highway. So instead of rerouting the road, they rerouted the waterfall. ODOT is currently in the process of a rather large scale Historic Highway restoration project, and Tom believes that while they’re at it, now is as good a time as any to restore Warren Falls. I happen to agree. If you’re interested in a far more in-depth telling of the history and logistics of the diversion of Warren Falls, check out Tom’s blog post about this same trip. I would also invite you to “like” Tom’s Restore Warren Falls facebook page if you’re interested in the cause. 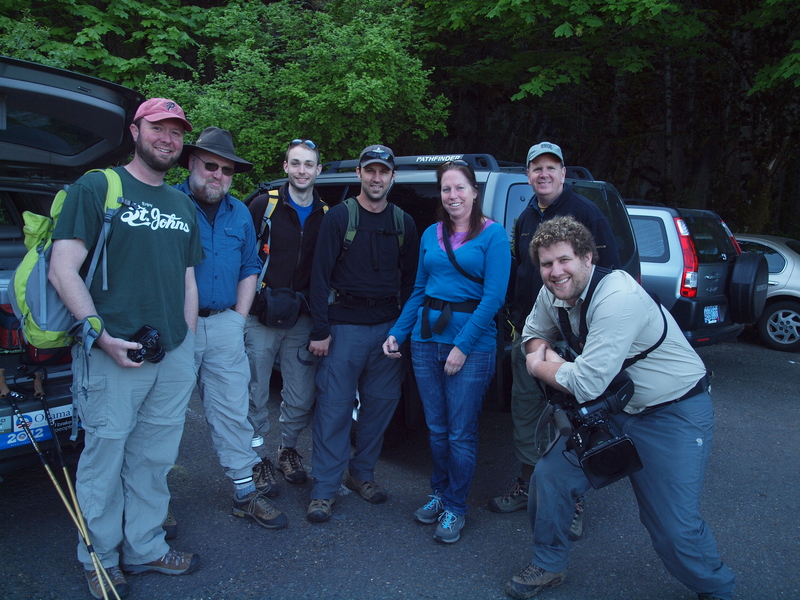 Tom, Jamie, and I met ODOT representatives Kristen and Andy, and Oregon Field Guide Producer, Vince Patton, and Cameraman, Michael Bendixen at the Starvation Creek Trailhead the morning of May 12th. The plan was to take the short hike to the base of what used to be Warren Falls and do some filming. 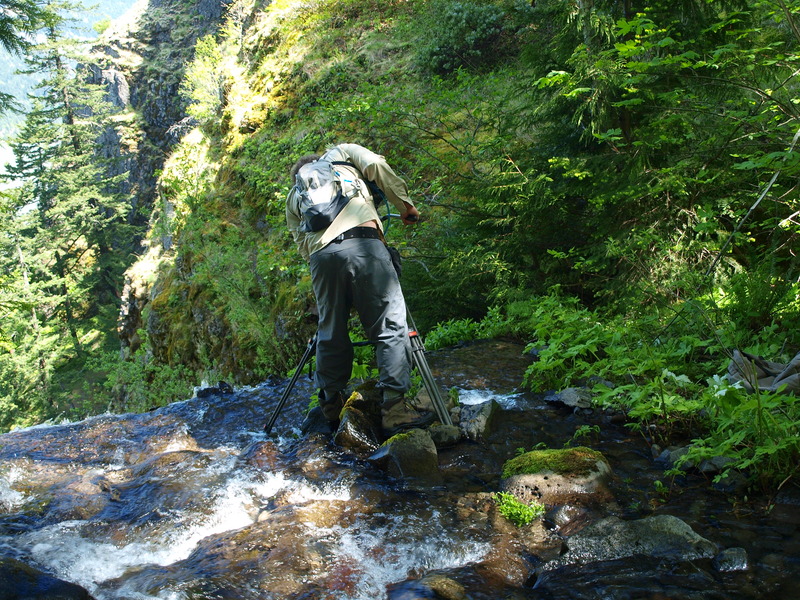 Then we would hike up to the top of the basalt cliffs and scramble down to where Warren Creek is now diverted. 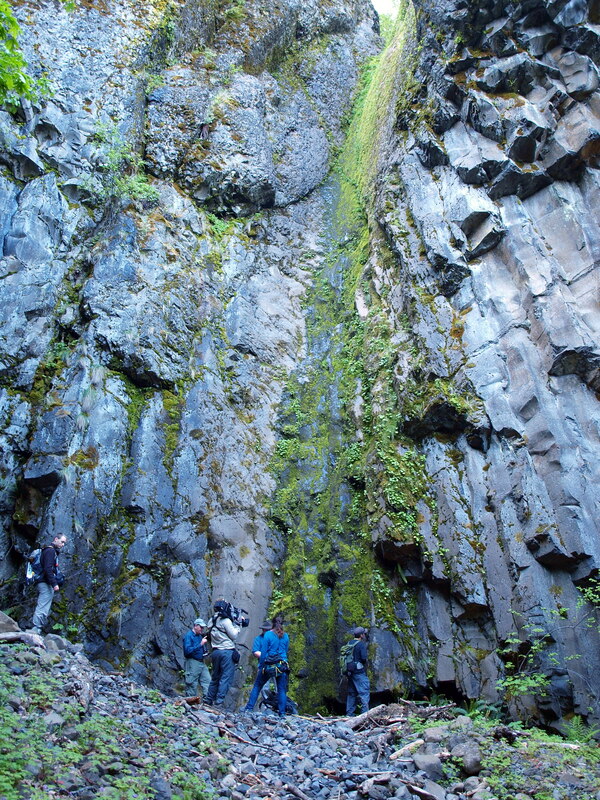 Do some filming and interviewing there, and then hike back down and film current day Hole-in-the Wall Falls. If you were doing this little jaunt all by your lonesome, you could stretch it out to about 2 hours. But if you’ve ever been part of a filming production, or in the military, you know that there’s a lot of hurry up and wait involved. I didn’t mind that at all. It was a gorgeous day out and it was a blast to watch Vince and Michael work their magic. 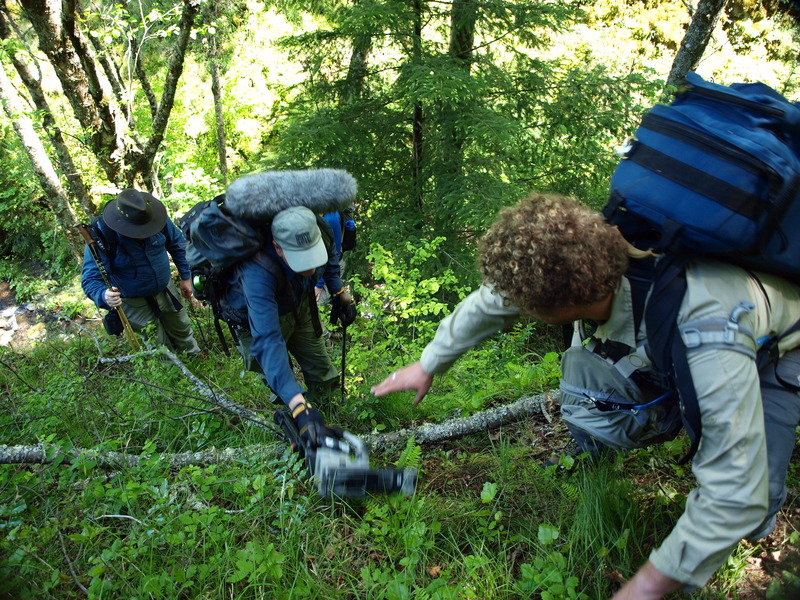 Setting up shots, recording nature sounds, and making us hike up and down the same piece of trail numerous times. The whole process was fun for me, save for the scramble down to the top of Warren Falls. If you’ve ever gone hiking with me, you know that I loath heights and exposure. Loath the m. The little scramble down to the Warren Creek weir diversion wasn’t long, but it possessed ample helpings of both height and exposure, with a large side of poison oak for good measure. Of course everybody else on this trip just scurried down and skirted the cliff like mountain goats; including the OPB guys with fully loaded backpacks of camera gear and production accoutrements. I shimmied down in a slow and calculating manner. When I reached the cliff at the top of the weir Tom was giving a dissertation to the film crew. Unbelievable. Here they were, inches from a death-worthy tumble, and they’re carrying on like it’s the Tonight Show. I waited for the ledge to clear before attempting to pass and reach the safety of the creek area above the falls. I’m willing to bet that most people would look at this spot and say, “Really Adam? That’s nothing. Just walk right there, skip up over here, ascend that boulder, and viola! Home free.” Not me. I was too busy trying to make peace with God/Allah/Budhha/the Cosmos and not stepping on the loose rock that would end it all. Once I made it to the creek I was able to change my shorts, relax, eat lunch, and watch the rest of the loons scout around the top of the weir. Impressed, jealous, concerned; all emotions I feel when I watch other human beings do this stuff. The OPB guys where really into it. Vince was exploring around and underneath the weir while Michael filmed it from almost every conceivable angle, to include in the creek at the lip of the would-be falls. Meanwhile the rest of us photographed the happenings, ate lunch, and explored the very scenic creek area. Then Vince interviewed us briefly and we scrambled back up to the main trail. It was a great hike back down. The views across the Gorge to Dog Mountain where inspiring and I was pleased as punch to have my feet on level, well-graded trail. We stopped briefly at Hole-in-the-Wall Falls for some filming and then made our way back to the trailhead parking area. We exchanged contact info and pleasantries, and then Tom, Jamie, and I hit the road back to Portland. You never know how things get edited. And since I’m not part of the story in anyway, I’ll be lucky if I get to see my red hat bobbing along on the trail once or twice. 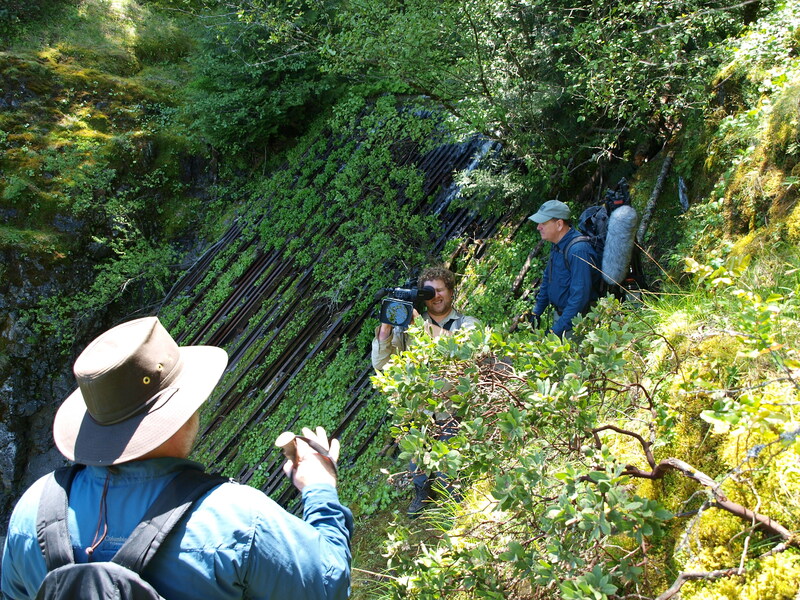 In the end though, I had the privilege of going out with Oregon Field Guide and hopefully getting the Warren Falls Restoration project a little more attention. What a day, and what an experience! Thanks Tom! Group photo courtesy of Tom Kloster. How exciting!!! That is so awesome!